Anonymous sale; Amsterdam, 9 December 1919, lot 114.
with Jacques Goudstikker, Amsterdam, 1919. Probably C. Hofstede de Groot, Beschreibendes und kritisches Verzeichnis der Werke der hervorragendsten Holländischen Maler des XVII Jahrhunderts, no. 632. C. Wright, Paintings in Dutch Museums. An Index of Oil Paintings in Public Collections in The Netherlands by Artists born before 1870, London, 1980, p. 507. Old Master Paintings: An illustrated summary catalogue, Rijksdienst Beeldende Kunst (The Netherlandish Office for the Fine Arts), The Hague, 1992, p. 317, no. 2815, illustrated. K. Eisele, Jan Wijnants (1631/32-1684), Ein Niederländischer Maler der Ideallandschaft im Goldenen Jahrhundert, mit umfassendem Oeuvrekatalog, Stuttgart, 2000, p. 143, no. 115, illustrated. Amsterdam, Jacques Goudstikker Gallery, Collection de la Collection Goudstikker d'Amsterdam, December 1917, no. 80. Delft, Stedelijk Museum Het Prinsenhof, on loan. Born in Haarlem, but working in Amsterdam from 1660, Jan Wynants was one of the foremost of the Dutch artists of the second half of the 17th Century who moved away from the restricted palette of the 1620s and 1630s. His paintings are predominately landscapes and dunescapes, following the tradition established by Pieter de Molijn, Philips Wouwerman, Jacob van Ruisdael and others. The use of a fallen tree trunk in the present composition is a device often associated with Jacob van Ruisdael. 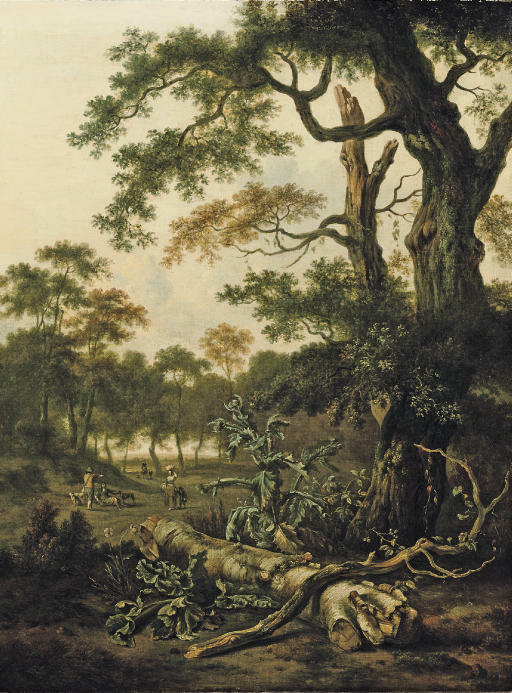 The juxtaposition of a verdant countryside with dead wood alluded, in the 17th Century, to the transience of life. Wynants' work appealed strongly to the eighteenth-century English taste for Dutch landscapes, and his work influenced artists such as Franois Boucher and Thomas Gainsborough. A similar composition was with Spencer-Churchill; Christie's, London, 29 October 1965, lot 102, as Pijnacker (280 guineas).